Finding the right ERP software solution is not an easy task to accomplish and can prove to be a long and tiring process, but undoubtedly it adds significant value to the organization operation and business flow. However, purchasing the ERP software is just a part of the whole process as the implementation, and end-user transition makes the final step for the entire process. The implementation part is where the most companies face trouble. An ERP software in most cases if not implemented correctly, can lead to decreased ROI, making the business vulnerable. To help businesses escaping the possibilities of any breakdown due to these risks, we have identified critical risks that need to be addressed while optimizing your ERP implementation. While implementing an ERP, it is essential to document the workflow and business requirements accurately before discussing it with the ERP vendor and thoroughly test them. These details help the ERP vendor in understanding your requirements and customizing accordingly, hence eliminating any workflow gap. The company needs to define the goals the new ERP software is set out to achieve. The process of selecting an ERP software is a futile attempt if a clear goal is not set. For setting a clear purpose and to understand the requirements of the business, it is essential to analyze the current system, and the processes inside and outside of the system must be followed in detail. 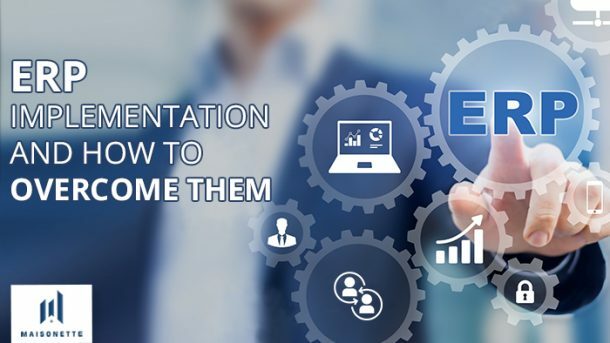 An ineffective ERP implementation can create various issues such as unnecessary features, poor alignment of the ERP system with the business operations, etc. While selecting an ERP software, it is important to choose the system that fits well with the needs of the organization. A proper analysis should be drawn to find the pain and risk areas of the organization, and then only the ERP software should be chosen that can address these sections along with various other functionalities. This analysis helps in avoiding multiple issues rising down the road, making the new ERP software a success. The ERP software chosen should be equipped with future state technology including additional interfaces and adequate infrastructure to withstand the demands of the performance. It is imperative for the organization to pay close attention to all the critical implementation processes such as budget and timeline, selection of the vendor and software, resource strategy, deployment methodology, etc. If failed in doing so can result in achieving less than what’s expected of the ERP software implementation, such as communication issues, ineffective internal support, delays, budget overages, etc. Commercial property management software is also a form of technology, and like every other ever-evolving technology, it has as well got a shelf life. Hence for a successful implementation, a version upgrade is usually the right solution. In such cases, a team of technology professionals continually working to update and enhance the efficiency of the ERP software, backing up the strong support system can take the business to the next level. When a new ERP software is implemented, all the data from the old system is required to be migrated to the new system. For most software, the cost of migrating the data is probably higher and more time consuming than implementing a new ERP software. The real reason for such pitfalls to occur is because the data, itself is the issue. The format of the tables used might be different, the software difference between the two systems, poor quality of data, etc. The best way to overcome these restraints is by choosing a commercial property management software that makes data migration easier in place of making it a sophisticated, grueling task. The ERP software by Maisonette with its team of technology professionals helps in overcoming all risk associated with the ERP implementation making it the best commercial property management software in the company. The risks are real, and it’s not always possible to avoid these risks but they can still be recognized in time and prevented, and Maisonette at every step focuses on being the support of their clients helping them overcome the issues with ease.